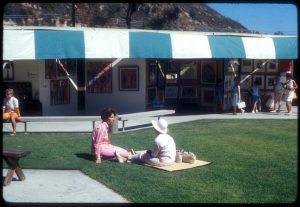 Guests enjoying ice cream during the 1965 Festival of the Arts. One of Laguna Beach’s most beloved traditions, Festival of Arts, celebrates its 85th anniversary with a revamped facility and a slate of new creative offerings. When an artist named John Hinchman mobilized a group of fellow local craftsmen to stage Laguna Beach’s first Festival of Arts back in 1932, he couldn’t possibly have predicted it would someday bloom into the kind of first-class creative gathering that attracts roughly 250,000 visitors each year. Now, with the annual event’s July 5 opening date on the horizon, organizers are ready to mark the juried festival’s 85th anniversary. The summerlong celebration will kick off with the debut of several new all-ages programs and the unveiling of one incredible piece de resistance: the festival’s reimagined facility, which recently underwent a period of sweeping renovations at a cost of $10 million. 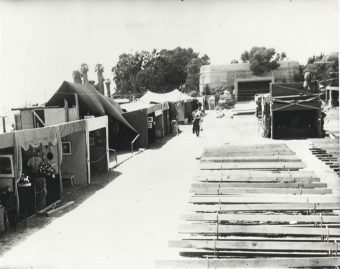 A snapshot of the festival grounds from 1935. In 1933, the festival’s second year, organizers introduced a series of “living pictures” that would eventually expand into the nightly Pageant of the Masters; Leonardo da Vinci’s “Mona Lisa” and James McNeill Whistler’s “Whistler’s Mother” were among the original selection of classic pieces depicted. 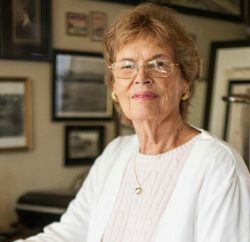 Without a permanent home base, the festival was held at various locations throughout Laguna until 1941, when James Irvine donated the 6-acre Irvine Bowl Park site that’s still in use under the auspices of the city of Laguna Beach. Yet the excitement over the space would only last a year; beginning in 1942, the festival went dark due to the United States’ entry into World War II and “concerns that surrounded the war, like blackouts and possible bombings,” Higuchi says. The gap, which lasted until 1946, remains the only one in the festival’s history. On the heels of the war, the festival launched a handful of new initiatives designed to appeal to younger artists, including children’s classes and the Junior Art Exhibit, a juried show that features work by Orange County elementary, junior high and high school students. Also with a view toward emerging creativity, the event’s organizers announced the establishment of the Festival of Arts Scholarship program, a means to provide financial assistance to graduating high schoolers who demonstrate artistic promise. The first $1,000 scholarship was awarded in 1957 and, over the past 60 years, the festival has provided more than $3 million to college-level students. 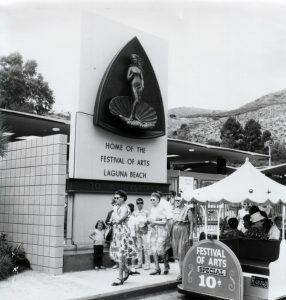 In 1962, the festival donated yet another grant—this time for $5,000—to help found the Laguna College of Art & Design; to commemorate the relationship between the two parties, festival exhibitors who are alumni of the college will display plaques at their booths as part of this year’s anniversary festivities. 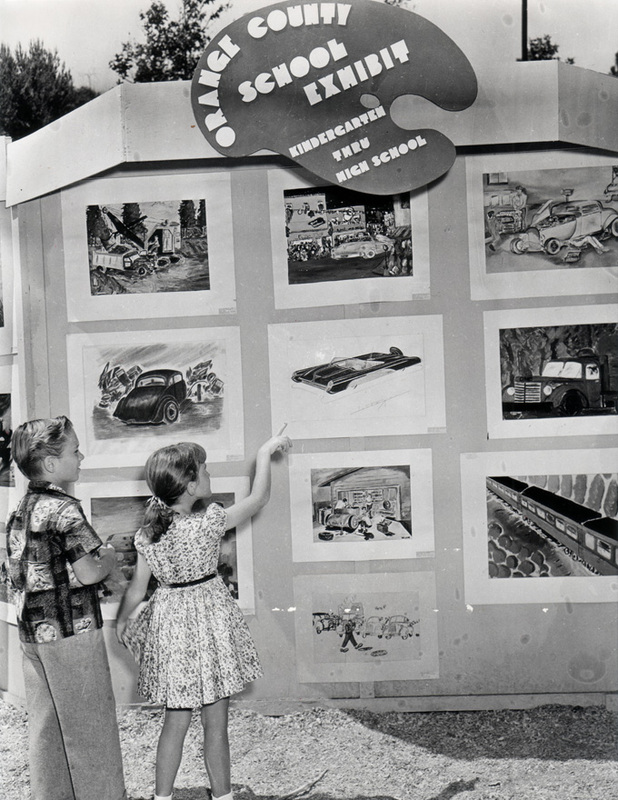 Young guests viewing work displayed in the Junior Art Exhibit in 1947. 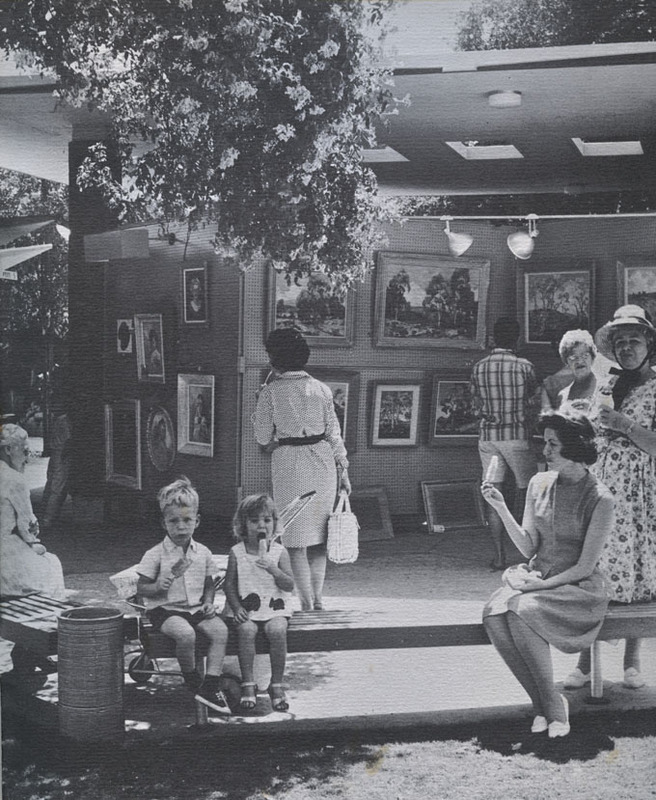 During the mid-1960s, an influx of up-and-coming artists to Laguna led to the 1966 debut of Sawdust Art & Craft Festival, a grassroots alternative to Festival of Arts that eschewed the traditional jury system and instead shined a spotlight on the area’s emerging craft movement. These days, Festival of Arts maintains its juried format, although the jury’s lineup of three working artists, three industry professionals (think gallery owners and professors) and one alternate member changes each summer to prevent stagnation. “Every jury is different, so it’s always a roll of the dice when it comes to what jurors are going to gravitate toward,” Higuchi says. “The festival has no quotas whatsoever and we accept all media, themes and styles of work.” With about 400 Orange County-based artists vying for 140 display spots each year, she adds, juries typically focus on the content and craftsmanship of contending artists’ portfolios and how well candidates demonstrate facility with their preferred media. The front entrance circa 1965. 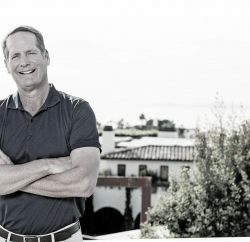 Festival leaders enlisted the team behind the Newport Beach-based firm Bauer Architects—known for its emphasis on sustainable design and award-winning work on projects like Dana Point’s Ocean Institute and Costa Mesa’s retail development The Camp—to devise a full-scale renovation plan for the space based on a series of multilevel terraces. The resulting layout features new gallery-style display pavilions covered by tensile roof coverings to shelter both artwork and patrons from the elements, as well as updated restrooms, widened walking paths and an expanded gift shop, all of which serve to make the guest experience more convenient. The festival grounds (shown in the 1960s) were last renovated in 1964. The City Council approved Festival of Arts’ new remodeling plans in 2015. A sprawling green space near the front entrance conjures up the feel of a public park and will play host to lounging guests, outdoor performances and art workshops. 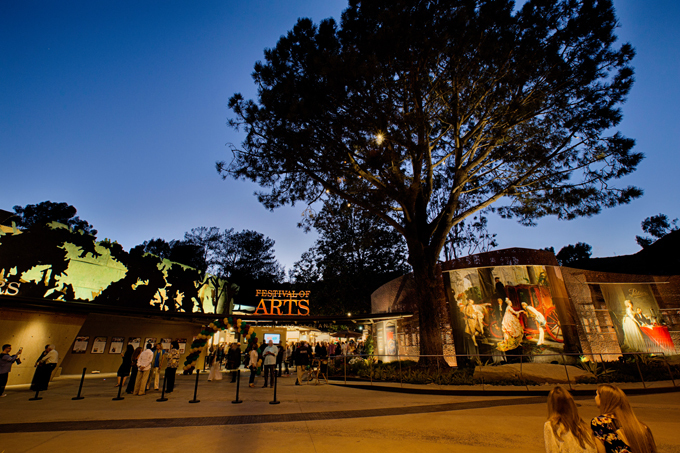 Likewise, the event’s Junior Art Exhibit has been relocated to a prime spot near the main entry point to ensure plenty of exposure for the next generation of artists; the Irvine Bowl’s historic amphitheater and Pageant of the Masters workshop areas, however, remain untouched. An important aspect of the revamp involved incorporating sustainable design elements. To that end, Bauer punctuated its plans with low-impact touches like LED lighting, natural ventilation and new systems of bioretention to properly manage stormwater runoff. Lucky for arts enthusiasts, the new digs aren’t the only additions to the festival this year. Held on Sunday afternoons between 2 and 4 p.m., the Salute to the Arts program will go beyond traditional visual media to introduce guests to disciplines like theater, dance and literature. According to Higuchi, the series “is inspired by the original Festival of Arts, which featured a variety of artistic endeavors” and will promote a different art form each week. Friday evenings from 5:30 to 7:30 p.m., meanwhile, will see the launch of the festival’s Step Into the Spotlight musical performances, which seek to present professional backup vocalists with precious center-stage time. The Festival of Arts’ new front facade, renovated in 2014-2015; a remodeling of the grounds is underway now. 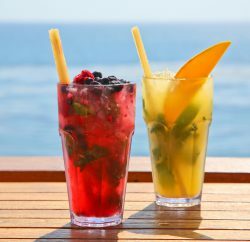 The broadened selection of offerings is intended to bring even more diversity to the event, all in the hopes of attracting new visitors to preserve its longevity. “Whether you’re an art collector, a family looking for activities for your kids or a millennial looking for a unique date night, we have it all,” Higuchi explains, adding that much of the festival’s focus has fallen on recruiting the millennial demographic and even younger generations. “In the last 20 years, I would say our audience for the festival is getting younger,” she says. ‘That’s by design.” Jazz concerts, wine and painting nights, and drop-in ceramics, drawing and printmaking workshops are just a few of the special programs for patrons of all ages that will be returning to the grounds this summer. In honor of its 85th anniversary, Laguna Beach’s Festival of Arts will host several themed events over the span of its eight-week run. Here are just a few of the highlights. Throughout the festival’s duration, guests are welcome to stop by an educational booth digitally showcasing the event’s 85-year history. In addition, three satellite exhibitions stationed at The Ritz-Carlton, Laguna Niguel, foaSouth and the third-floor rotunda of Laguna’s Wells Fargo building will feature pieces from the festival’s permanent collection and a retrospective of annual posters. With a nod to the past, the festival will pair its popular exhibitor-led Art Talks with a variety of teas on Wednesdays between noon and 1 p.m. The festival will launch its new Junior Art Gallery with a red-ribbon dedication and reception, plus opportunities to meet with young local artists. On the festival’s official birthday, guests will enjoy perks including complimentary admission and a massive anniversary bash complete with cake, music and other family-friendly activities.